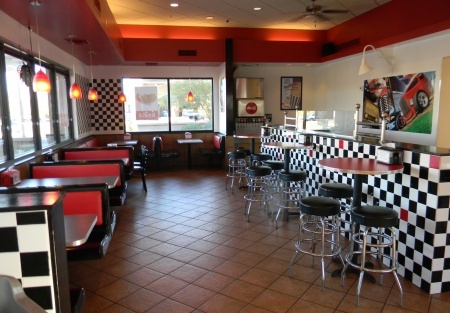 FRANCHISE BURGER AND ICE CREAM SHAKE RESTAURANT FOR SALE GILBERT AZ GROSSING MORE THAN $60k a Month! Famous FRANCHISE Diner style fast casual with amazing milkshakes, handmade onion rings, and great burgers served with a amazing fry sauce! This Franchise Group was Established in 1960. The original location still exists today and is a landmark. Now available in AZ with the East Valley location! The restaurant's setting sends one back in time when things were simpler in life. Come inside the restaurant and you're sent back in time 60 Rock N' Roll was in its infancy stage, there were no super highways, and stops like these were where the folks would cool-off their pallets with an ice cold Milk Shake, a good ole burger and some great conversation with travelers. The owner absentee and have full time jobs. The building has about 2,886 square feet inside and about 300 square foot patio. This restaurant free standing has inside seating for 96 patrons and over 13 for the outside. There are 1 full time manager and 10 part time employees. This restaurant business currently does $65,000 in monthly sale but lacks a full time owner to grow the business to its full potential. The owner's cash flow in 2013 should be in teh $85,000 range. So this is priced to sell as most franchises are selling for more than 3 times cash flow. Most people who own a franchise do so because they want to run their own business. They want a good long term investment, something that is easy to start and operate and has the potential for great success. This concept has a long history of success and has been implemented through years of development. This expertise has been carefully documented in proprietary Operations Manuals, which together with continuing hands-on support, guide franchisees through each step of starting and running their stores. This business may be able to obtain an SBA loan depending on the strength of the Buyer in terms of experience, credit and down payment.